Overactive Bladder (OAB) affects roughly 33 million Americans. While it may not be life-threatening, it can be life-altering. It's symptoms include a frequent and urgent need to use the restroom, waking up several times at night to urinate, and sometimes leakage. It's most common in women, but OAB can also affect men. The good news is that it can be treated, and The National Association For Continence is here to help. We've assembled a range of educational materials, tools and guides to help you navigate this condition and your treatment path. Check out all the great information below - and check back often. We're continually updating this page with new resources to help you find the solutions you deserve. The NAFC OAB Treatment Tracker is designed to help you learn more about the options that are available for the treatment of your overactive bladder, including many you may not have heard of before. Once you've completed your questionnaire, a free, personalized email will be sent directly to you. The information you receive will help you better manage your condition, and we encourage you to share them with your doctor for use in the diagnostic and treatment process. Click here to begin your assessment now. Education. Tips. New treatment options. Learn more about Overactive Bladder and what you can do to manage it. Nancy Muller, PhD, former executive director of the NAFC, offers guidance and insight on OAB. 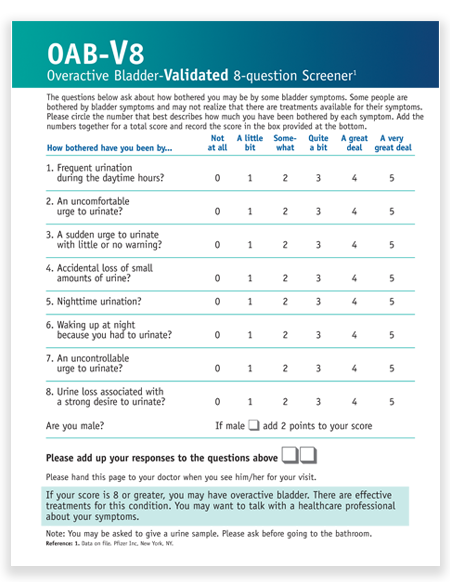 Learn how to talk to your doctor, learn about bladder retraining for OAB, and track your bladder habits with these useful OAB downloadable resources. Click on any of the images or text below and your guide will open in a new window. We encourage you to download these guides, print them out, use them yourself and take them with you to your doctors' appointments - they're all intended to help you find treatment options that produce real, meaningful results. This easy, 8-question screener is a great tool to help evaluate just how severe your symptoms are. Your answers can help your doctor provide an accurate diagnosis and determine the best treatment options available to you. Click on any of the images below to read recent blog posts about OAB, including education and advice from our experts as well as from real people struggling with OAB and incontinence. To search even more articles on OAB, click here for our complete blog.